The 4 star Viking Nona Beach Hotel has an oceanfront location in Kemer, situated in the renowned Antalya town on the south-west coast of Turkey. Providing an All Inclusive package, the Viking Nona Beach Hotel welcomes couples and families to enjoy its 94 attractive rooms and private pebble beach facilities, pools for adults and children and good dining choices. There is a good family-friendly atmosphere with the focus on relaxation and taking it easy. 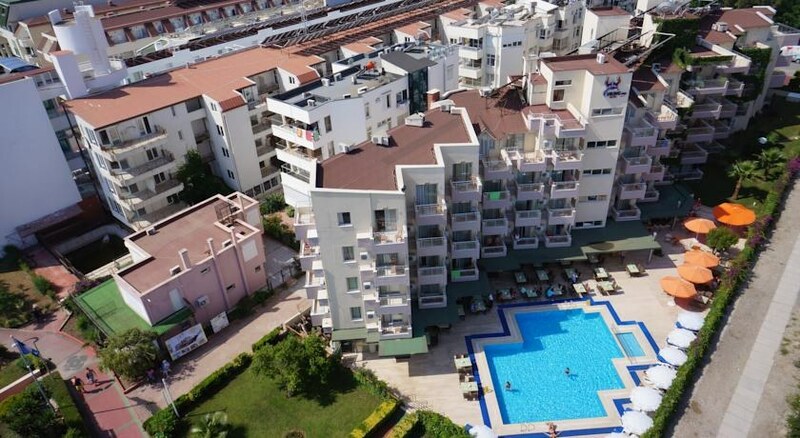 Enjoy some fun, sun and sea at the Viking Nona Beach Hotel and experience some Turkish hospitality. Getting to the hotel: 55km to Antalya International Airport. 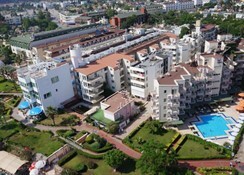 Local tips: Kemer is a cosmopolitan resort with a good choice of shops, bars and restaurants. There is plenty of choice all within easy walking distance. Please note: Rates and conditions are exclusive to UK passport holders only. Food, drink and entertainment: Main restaurant with terrace offers buffet-style of local and international dishes, pool bar and beach bar, snack buffet for light meals. Sport, games and activities: Swimming pool with sun terrace, gardens, private pebble beach, loungers & parasols and beach towels. For the kids: Children's pool connected to main pool, children's activities hosted, babysitting service, high chairs available. Additional: 24 hour Front Desk, housekeeping, room service, free WiFi internet in lobby (chargeable elsewhere), laundry & dry cleaning facilities, medical facilities, jewellery store, photography service, car rental arrangements. Guest rooms have a bright and cheerful decor of pastel shades, comfortable furnishings and modern conveniences; features include a private furnished balcony with land/sea view, individually-controlled air-conditioning, en suite bathroom with bathtub or shower and hair dryer, carpeted floors, satellite TV and music channels, direct dial telephone, mini fridge and safe box. There are 87 standard rooms, 6 family rooms and 1 adapted room for disabled guests.